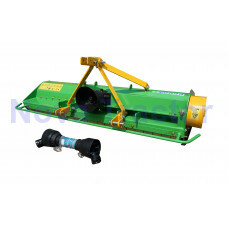 EF flail mower Light duty flail mower for small tractor with 15HP to 40HP with CAT I, 3-point hitch. MD flail mower Flail mower for small and middle tractors with 18HP to 60HP with Cat I/II, 3-point hitch. MFZ flail mower Middle duty flail mower for tractors with 25 - 65HP with CAT I/II, 3-point hitch. 20inch offset capacity. MFZ135 has been sold out, we have MFZ155/MFZ175/MFZ195 available in stock, call us for details..
ATV Pull Behind Flail Mower - 420cc Briggs & Stratton engine - 0.7LBS(320gram) forging hammer - ..
EF-series - for working widths from 95cm/37inch to 175cm/68inch. Free shipping to any location wit..
MD(Middle duty) -series - for working widths from 135cm/53inch to 195cm/76inch.Free shipping to any ..